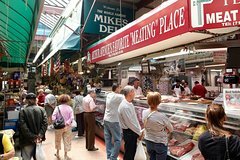 Bronx resident, Historian, and Food Aficionado, Susan Birnbaum, takes you to some of her most cherished spots along Arthur Ave in the Belmont section of the Bronx - New York's "real" Little Italy.. Taste the best, authentic Italian treats available anywhere in New York. See thin ribbons of fresh pasta and warm, fresh mozzarella being made before your eyes. Susan even knows a man who’s been hand rolling cigars for decades. Munch on cheese, sweet cannolis, and many more delicious tastings! clock and wend our way up to the Bronx. From Grand Central, it is a twenty minute ride to the Fordham Rd Metro Station. If you prefer to meet us in the Bronx, arrangements can be made. Purchase the specially priced Metro North 'city ticket' to Fordham Rd. On the tour we will explore this unique enclave, as we meet the locals, check out bread stores, pastry shops, visit markets and taste along the way. Stops include: the Arthur av Market with it''s cigar rollers, cheese makers, and deli's. Learn the history and hear how this 'nabe' became the "real" Little Italy in the Bronx. The tour includes seven to eight taste on Author Ave and the surrounding area. There is some traditional Italian food tasting and we will be walking around the neighborhood, so wear comfortable walking shoes!